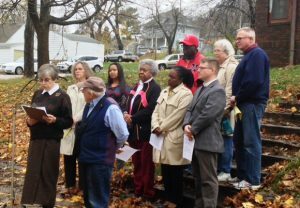 OTOC leaders held a press conference on November 17 at a long abandoned house on Belvedere Blvd to express their support for the City of Omaha Vacant Property Registration Ordinance and to call for continued work by OTOC, the Mayor and City Council and Registrar of Deeds to identify whether Omaha has a “Zombie Mortgage” problem in Omaha. OTOC chose to meet at this house because Deutsche Bank holds a “Zombie Mortgage”, meaning the bank has chosen not to foreclose on it for over 5 years and refused the owner’s effort to give the deed back to the bank in 2012. All the while this once fine home has deteriorated to the point it may have to be demolished. 1) Pass the proposed ordinance because it would be a powerful tool to deal with vacant, deteriorating properties with irresponsible owners. The initial version of the ordinance sought to impose a registration and maintenance requirements on banks holding mortgages on properties that become vacant, even before the bank had foreclosed. OTOC believes that the revised ordinance stripped out most of those requirements and banks must register and maintain vacant properties only after the have completed foreclosure or accepted a deed in lieu of foreclosure. As OTOC leaders noted, some foreign banks like Deutsche Bank and other sub prime lenders have a history of delaying or never foreclosing on a vacant house in a low income community because they don’t want to assume responsibility for the property. 2) OTOC wants to work with the City of Omaha and County Registrar of Deeds to develop and make public a list of the houses in the City of Omaha and Douglas County where a notice of default has been filed by a financial institution, the house is vacant and the financial institution has not completed foreclosure after two years. This information would help OTOC and policy makers assess whether there is a significant “Zombie Mortgage” problem in Omaha. OTOC also asked the City to determine if any of the 880 houses on the City Demolition list have Zombie Mortgages and have deteriorated because neither the owner nor the mortgage holder would take responsibility for the property over a course of many years. 3) Prevent Zombie Mortgages through Nebraska Foreclosure Law: OTOC would like to work with the City Council, members of the Unicameral and the Nebraska Bankers Association to change the Nebraska foreclosure law. OTOC wants the Unicameral to assure that financial institutions have an obligation to complete their foreclosure process within a reasonable time—not drag it out for years while allowing a vacant house to deteriorate and become a blight on the community.